Tune in Wednesday evening from 6-9 PM to hear this week's edition of the Musician's Show, where we will be joined by trumpeter, composer, bandleader, and educator Josh Lawrence and drummer Anwar Marshall. 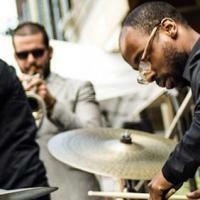 Lawrence and Marshall are both graduates of the music program at UArts and are regular members of the Orrin Evans Captain Black Big Band, which features some of the best soloists from New York and Philadelphia. Lawrence continues to teach as a Senior Lecturer in the School of Music, while also engaging in a variety of recording and compositional endeavors; he has recorded with Erykah Badu, and has released two solo albums, the latest featuring seven compositions for trumpet trio. Lawrence and Marshall founded the Fresh Cut Orchestra with bassist John Fraticelli in 2012. The ten-piece band peforms an eclectic blend jazz, contemporary classical, progressive rock, hip hop, and modern electronica music. They were was recently selected as artist-in-residence at the Kimmel Center for the Performing Arts in Philadelphia, which will feature workshops and performances and culminate in a new work. Be sure to tune in this Wednesday Night!